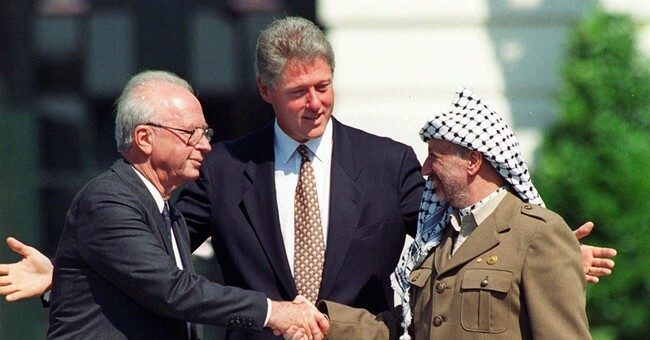 TWENTY-FIVE YEARS ago next week, on Sept. 13, 1993, the Israeli-Palestinian "peace process" was formally launched with the signing of the Oslo Accords at a White House ceremony hosted by President Bill Clinton. The moment was captured in an epochal photograph of Israeli Prime Minister Yitzhak Rabin and PLO chairman Yasser Arafat shaking hands before a beaming Clinton. I was there that day, one of many guests on the South Lawn of the White House invited to witness the encounter in person. A quarter of a century later, there are two things about the event I vividly remember — one small but telling, the other overwhelming and pervasive. The small detail was Rabin's unwillingness to grasp Arafat's hand. After the documents were signed, Clinton had reached out to coax the two men into a handshake, his outstretched arms nudging them toward each other. Arafat needed no coaxing: Grinning broadly, he readily extended his hand to Rabin. But the Israeli prime minister, clearly uncomfortable, at first didn't reciprocate. Rabin, who detested the PLO chieftain, had deep misgivings about the Oslo deal, which had been engineered by Foreign Minister Shimon Peres. "So deep was his loathing of Arafat," writes historian Efraim Karsh in the fall issue of Middle East Quarterly, "that he planned to shun the Washington signing ceremony altogether" and had to be cajoled into coming by Secretary of State Warren Christopher. Rabin reluctantly agreed to "take an anti-nausea pill" and go to Washington, but he wanted as little contact as possible with Arafat, a homicidal monster with much innocent blood on his hands. Inside the White House, before the signing ceremony, Rabin had deliberately kept his distance to avoid shaking hands with Arafat. But on the South Lawn, with the world watching, Clinton left him no choice. My other indelible recollection of that day is the jubilation of the onlookers. Longtime observers of the Middle East were transported with elation, ecstatic in the belief that peace was coming to the Holy Land. The giddiness was unreal, in some cases literally driving antagonists into each other's arms. I was astonished to see the president of the pro-Israel lobby AIPAC embrace the president of the Arab American Institute. Saudi Arabia's normally serene ambassador to the United States, Prince Bandar ibn Sultan, gushed when I approached him for a comment. "Can you believe it?" he marveled. "A week ago, who could imagine Rabin and Arafat shaking hands?" From the perspective of 25 years, however, it's clear that Rabin's deep skepticism was sound and the public's euphoria groundless. The Oslo process didn't lead to peace. Arafat's pledge to renounce "terrorism and other acts of violence" was a sham. In an Arabic-language broadcast on Jordanian TV the very day of the White House ceremony, he assured Palestinians that he was signing the accords not to end the conflict, but to acquire territory from which the war to "liberate" all of Israel could be pursued. The Oslo process was the worst self-inflicted wound in Israel's history. Palestinian terrorism didn't end, it spiked. In the 24 months following the handshake, more Israelis were killed in bombings and suicide attacks than in any previous 24-month period in the country's history. Yet Rabin, of all people, refused to pull the plug. He had declared at first that the Oslo accords were reversible; if Arafat and the new Palestinian Authority didn't uphold their commitment to halt all violence, Rabin had said, Israel would reoccupy the territory it relinquished. It was a threat he never carried out. Instead, as terror attacks surged, Rabin grimly repeated that the empowerment of the Palestinians must go forward. "For all his exasperation, he could not bring himself to break with Arafat," writes Karsh. "Acknowledging that Arafat had made no serious effort to fight terrorism or to enforce law and order in Gaza, he nevertheless insisted that 'there is no other partner. . . . We must abide by our commitments.' " It was as if, having surmounted such a steep psychological barrier and forced himself to publicly shake Arafat's hand, nothing could ever again induce him to reverse course. Perhaps that would have changed had Rabin not been assassinated, but there's no way to know. Twenty-five years on, Oslo is a monument to the folly of magical thinking in diplomacy. Land-for-peace was a deadly delusion. The crowd swooned at the White House that day, but it was Rabin whose instincts were right. He should have trusted his intuition and refused to take that anti-nausea pill. Instead he shook hands with a mass killer, and led his nation into disaster.